Joanie has a strong passion for reading, and her love for books with nail-biting suspense, inspires her to write contemporary suspense novels. Thankful that God has given her the ability to write from her home in the country, she strives to use that opportunity to honor Him in all of her writing. Joanie and her husband, Ben, live in a country home near Madison, Georgia. There they raised and home-schooled their three children. She enjoys cooking, taking long walks, painting oil portraits, and caring for their home in the country. 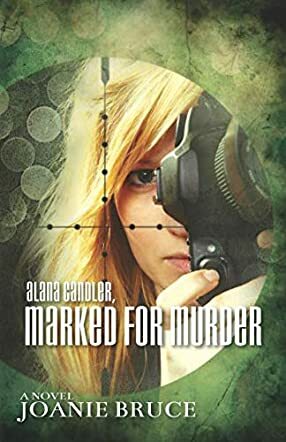 Alana Candler, Marked for Murder was just one twist after another in an action packed mystery that reads like a thriller. Toss in a dash of romantic tension and I just couldn't put it down. Literally. I read it in one sitting. It was well-paced and well-written. It is clear that author Joanie Bruce has a gift for suspenseful story telling. The story follows Alana, who finds herself unsuspectingly targeted for murder. Confused and on the run, she finds an unlikely hero in her brother’s old high school buddy, Jadyn, now a successful businessman. When the two collide, there is an attraction that can’t be denied, but neither can it be dealt with easily because Alana’s life is on the line and Jadyn must hide his profession since she has had a bad run of relationships with men in powerful positions in the past. There was solid character development, including the development of dynamic supporting characters that made the story feel authentic and truly come to life. The romantic thread was well balanced with the main plot of Alana's survival. The hero, Jadyn, is definitely a likable fellow as the dashing knight in shining armor who constantly swoops in to save our helpless heroine. My only minor complaint is that his character was pushed a little bit into the zone of too idealistic. Even still, it was one of those suspenseful romances that was clean and I could still feel the pull between the characters in a way that made me root for love to win! "The Reason for Murder" is full of nonstop action. You will be constantly on the edge of your seat as the author weaves a plot that is thrilling and continuous. I had a hard time putting this book down. I also loved the faith that Alana put in God as she faced the numerous threats against her life. The romance is very touching. If you love adventure, romance and thrills you won't be disappointed! Great writing and great suspense!